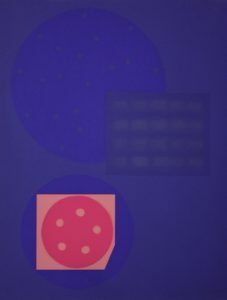 This silkscreen print by Marten Hendriks was printed in 1992 in the print shop of Hans Jansen. It is part of the portfolio Uit de buurt, in which six prints from different artists from the neighborhood were brought together. Marten Hendriks (Doetinchem, 1941) graduated in 1963 from the Academy for Visual Arts in Arnhem. He uses various methods and techniques to create work that can never be completed. Every image that he makes is a commentary, revival, explanation or critique of all his previous works. Despite the enormous variety, there is a strong connection between all his works. Museum Boijmans Van Beuningen is currently showing an overview of his work in the exhibition Time Slip. Also on show during this exhibition will be the new monograph Marten Hendriks – Life and Work written by Alex de Vries, which was realized with the support of the Mondriaan Fund, the Prins Bernhard Cultuurfonds and the Jaap Harten Fonds and appeared with Uitgeverij De Zwaluw. On the website of Mister Motley you can read an earlier article by de Vries about the work of Marten Hendriks: De tekortkomingen van Marten Hendriks.